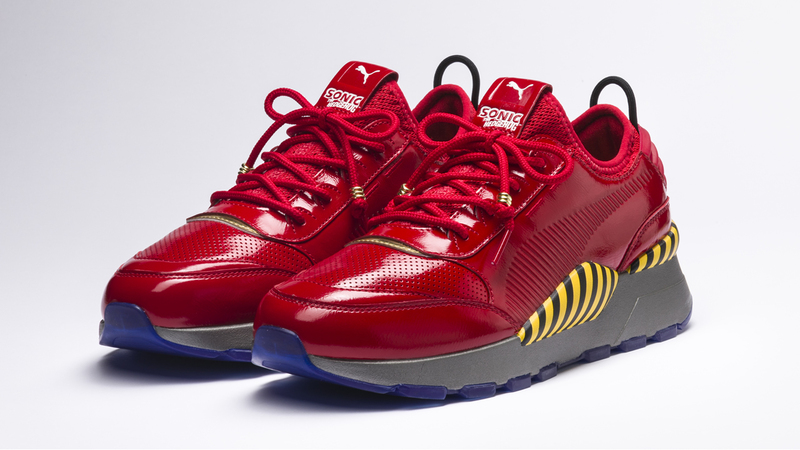 Puma's 1980s Running System design returns in the new Sega-inspired RS-0 Sonic and Dr. Eggman sneakers. Sega enthusiasts and Sonic the Hedgehog fans are known as types who yearn for the heyday of 2D platformers and fighters, a time when arcades were still hot and buzz terms like "Blast Processing" fueled the fires of the schoolyard console wars. Sonic has made a name for himself by throwing back to that era, and now it seems shoe designer Puma is tuning in to the retro vibrations, as the company has revealed a new partnership with Sega to produce a set of Sonic the Hedgehog-inspired shoes created in the classic 1980s Running System style. The new sneakers are designated RS-0 Sonic and Dr. Eggman, and they call back to the RS style of Puma sneakers popular in the late 80s. The Sonic sneakers reflect the colors and themes of Sonic the Hedgehog and the recognizable Green Hill Zone, with textured blue suede matched to a red outsole and accents of green grass and gold rings. The Dr. Eggman model follows suit, with black and yellow stripes set to a red footbed and leather upper. Both sets of sneakers include features like debossed Puma Formstrips, micro ventilation perforations, customized branding, and a translucent sole with the Sonic the Hedgehog logo featured within. Sega fans and sneakerheads alike won't have to wait long before they can scoop up a pair of these retro-inspired kicks, as Puma will be releasing the Puma RS-0 Sonic and Dr. Eggman models to the general public on June 5. Both will retail for $130 per pair, and purchases can be made over at select retailers or on the official Puma website at Puma.com.